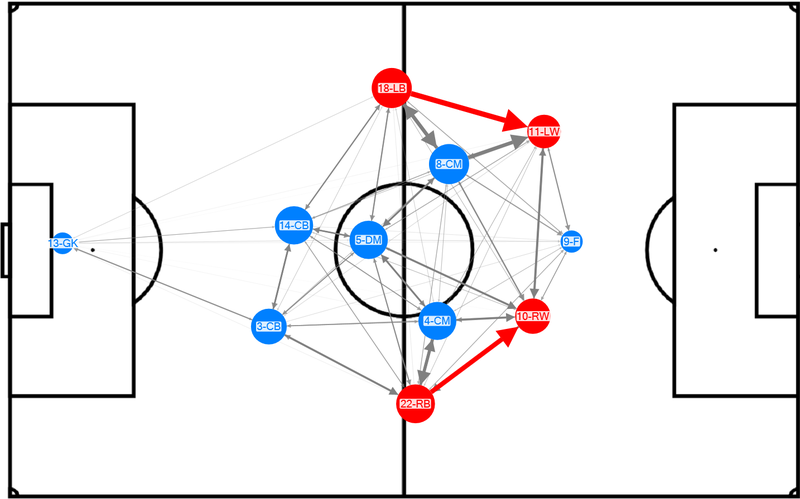 sportsmatrix » A Move Away from Tiki-Taka? 2014 signalled a change of guard at the Camp Nou, as Barcelona were beaten in the Champions League and to the La Liga title by Diego Simeone’s tough tackling, defensively solid Atletico Madrid with their no-nonsense direct style of football. It was also the year in which the Spanish national team was humbled at the World Cup in Brazil, following consecutive European Championship victories in 2008 and 2012 and their first taste of World Cup glory in 2010. In June 2014 after being appointed head coach at Barcelona, Luis Enrique knew that time had arrived with Barcelona’s playing style in need of significant revitalization and changes to better the familiar tiki-taka style. During his first full season in charge, Luis Enrique perhaps exceeded even his own expectations, winning La Liga, Copa del Rey, the Champions League, the UEFA Super Cup as well as the FIFA Club World Cup. Barcelona enjoying its seat on top of the La Liga table at the end of 2015 and having scored a record 180 goals in all competitions in a calendar year, can there truly be any doubt that Luis Enrique is very much the deserved winner of the FIFA World Coach of the Year? The SportsMatrix analytics department dug deep into the data to examine the changes in the Barcelona style over the past five seasons in La Liga games and discovered the following. Tiki-taka means keeping hold of the ball for long periods and denying possession to your opponents. Under Guardiola, Barça maintained close to 70% live ball possession, there was a slight decline under Villanova (68%), followed by another fall under Martino (66.6%). 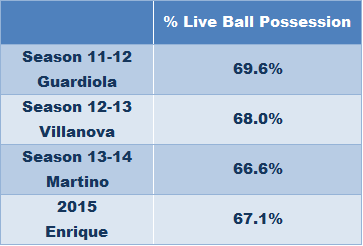 2015 saw a slight recovery with Luis Enrique’s team maintaining 67.1% live ball possession. 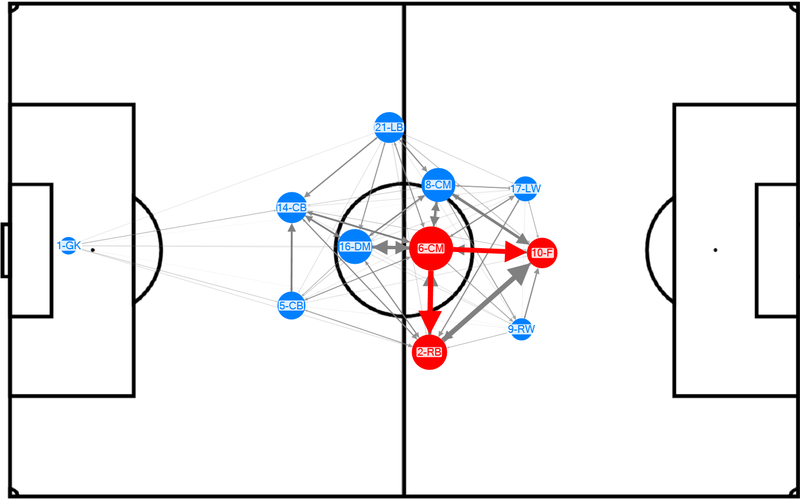 Each Barcelona attacking move is a work of art, with intricate passing patterns as the ball is stroked between the players. 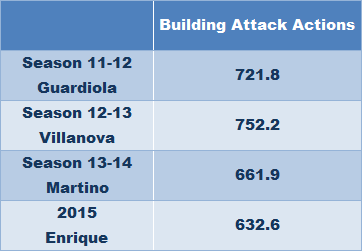 Under the reign of Guardiola, Barcelona would carry out more than 720 building attack actions (attacking actions in early stages of attack) within a single game as they constructed their attacks, with this figure increasing to 752.2 actions a game under Villanova. 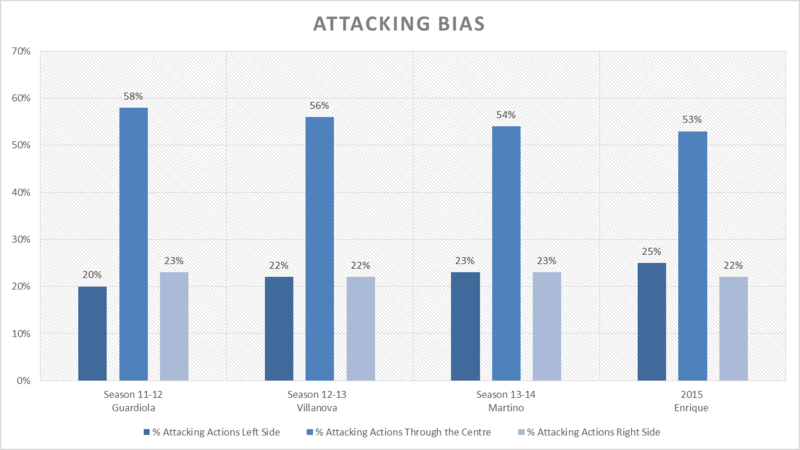 Whilst Barcelona continued to play tiki-taka under Martino, he introduced some of his own tactics, leading to an 8% reduction in the number of attacking actions compared with Pep’s Barcelona. However the season ended in disappointment and with relative failure, Martino’s Barcelona were knocked out of the Champions League by Atletico Madrid in the quarter final and pipped to the title by the same team on the last day of the 2013-14 season. Barcelona continued with tiki-taka under Luis Enrique; but there is a noticeable change, with a more direct style, which has seen the number of attacking actions per game fall to 632.6. The introduction of a more direct style has led to a significant increase in Barça attempts to counter attack, with the Catalans performing almost twice as many counter attacks per game compared to 2010. This perhaps another sign that the 2015 version of Barcelona are willing to release the ball quickly and where necessary to bypass the midfield. They may be seeing slightly less of the ball and cutting down on the passing interchanges; but it’s what Barcelona do with the ball in front of the opposition goal which is of greater importance. A criticisms of tiki-taka, sometimes valid, is that for all its beauty, sometimes the end result can be a disappointment. During Guardiola’s final season at the Camp Nou, his team created on average 15.7 chances per game from open play football. This figure increased slightly under Villanova (16.5) and up to 18.3 under Martino. Fast forward to 2015 and Luis Enrique’s more direct playing style and Barcelona are now averaging a significantly higher 19.5 chances per game. So whilst the 2015 version of Barcelona carries out fewer actions in building their attacks and holds onto the ball slightly less, when they do have the ball their direct style results in the team averaging more open play chances per game. In addition to the quantity of chances increased there has also been a significant improvement in the quality of Barcelona’s open play chances. The Barcelona vintage of 2015 appears to prefer the end result over the beauty of the creation. Under Pep, there were times when the beautiful build-up play was let down by the quality of the chance created. Under Luis Enrique, the beauty is in cutting open the opposition defence and creating a gilt-edged goal scoring chance, a figure that has increased by more than 15% compared to season 2011-12. Luis Enrique’s Barcelona shoot from a lower percentage of their open play chances (49.6%), seemingly preferring to improve the quality of the goal scoring chance and shooting only when the likelihood of scoring is that much greater. 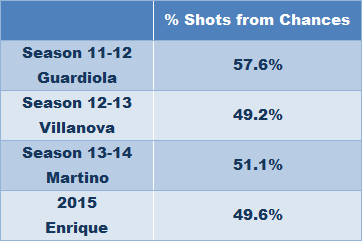 Under Guardiola the team shot from 57.6% of all chance situations, this fell sharply to 49.2% under Villanova, increasing slightly under Martino (51.1%). For anyone questioning the effectiveness of Barcelona’s change to a more direct style of building attacks, with a focus on creating gilt-edged goal scoring chances, then breaking the goal scoring record of 180 goals in the calendar year of 2015 should be sufficient evidence that the system has been effective. The playing formation has not changed significantly; with that being said though, there are clear differences in the positioning of certain players and in the passing distribution, which has seen Barcelona make greater use of the wings and becoming less reliant on playing through the centre. Of course it helps having a front three comprising Messi, Suarez and Neymar, but even when Luis Enrique has found himself missing one of these players, the replacement has fitted into the system seamlessly. Perhaps the most significant change has seen Messi relocating from his familiar central attacking position to playing wide on the right; but with a tendency to drift into the centre drawing closer to Luis Suarez. Although Neymar also drifts into the centre, he has been more disciplined, spending more of the game wide on the left, where he interacts closely with left back Jordi Alba and Iniesta. Barcelona Passing Distribution – 2015 (Enrique): the red arrows and thicker lines represent the most passes between players. This change in attacking roles has seen a marked switch in the team’s attacking focus, with greater emphasis on attacking down the left at the expense of attacking actions through the centre. All three managers prior to Luis Enrique, made less use of the wide areas, preferring to pass the ball through the middle, with Xavi delivering a high percentage of his passes forward to Messi, but with a significant contribution from Dani Alves. This change is very apparent when examining the top two passing combinations (passer and receiver). For the first time since the introduction of their tiki-taka style, there was no Barcelona midfield player involved as either of the top two passers or receivers in the team’s attacking build-up play. Under Guardiola, Villanova and Martino, the central midfielders – Xavi or Iniesta – were key to Barcelona’s attacking play, with the highest volume of passes delivered and received. With the arrival of Luis Enrique there has been a noticeable reduction in the number of balls played through the midfield, with a significantly greater percentage of passes delivered directly to the front line, especially to their wide attacking players. The following graphs highlight the dramatic decline in Barcelona’s playing through the midfield. 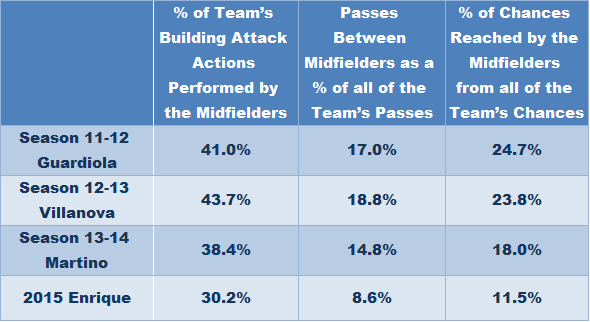 The percentage of passes between the midfielders as a percentage of the team’s total number of passes. The percentage of chances reached by the midfielders compared to the rest of the team. The graph and table clearly display a significant decline in the involvement of the Barcelona midfielders in their attacking play in 2015. The next graph reveals the importance of Barcelona’s attacking players under Luis Enrique. 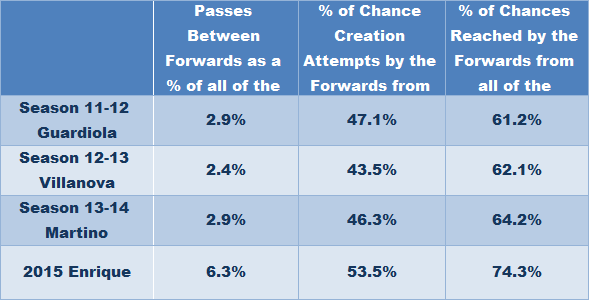 The passing distribution between the forwards as a percentage of all of the team’s passes. The percentage of chance creation attempts by the forwards to the total number of chance creation attempts made by Barcelona. The percentage of chances reached by the forward players, compared to the total number of chances reached by Barcelona. The graph and table clearly reflect a significant increase in the involvement of Barcelona’s attacking players in 2015. With 292 goals in 327 appearances for Barcelona, Lionel Messi’s achievements are truly astonishing. Game after game, year after year he has played a major role in his team’s success since making his debut in 2004. Perhaps one of the biggest challenges that Luis Enrique faced, was to integrate three unique and absurdly talented forwards into the same starting 11 and to lessen the load that Messi has coped with during the past decade. 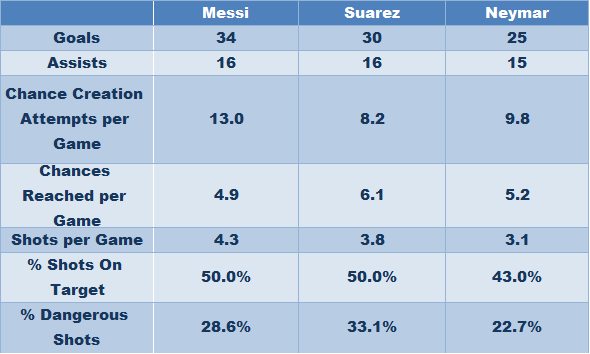 In recent years Messi has played in a central attacking role, but at the start of 2015 he was moved out to the right, the position he played at the start of his career, with Suarez playing in a central position, and Neymar playing wide on the left. Although Messi on average reached 4.9 chances per game in 2015, for the first time since the 2011-12 season he no longer led the table in the number of chances reached, with Neymar averaging 5.2 chances per game and Suarez reaching 6.1 chances per game. When examining the percentage of chances that Messi reached as a percentage of the team’s total chances, 2015 has seen a noticeable decline, with his attacking partners taking their share of the load. In this new role, Messi has significantly increased his number of attempts at creating a chance (13 per game), although his success rate at converting chance creation attempts into chances has actually fallen to 36.6%, compared to 39.2% under Guardiola, to 41.1% under Martino and to 46.1% under Villanova. Despite his tendency to drift from the right into central areas, he is averaging marginally fewer open play shots on goal per game (4.3), although similar to the figures under the previous three managers. But with the massive contribution coming from Suarez and Neymar this has no effect on the goal scoring output from the Blaugrana, as can be seen in the table below. The high possession, tiki-taka style, synonymous with Barcelona, worked largely because of the qualities of the midfield trio. With the departure of Xavi, Luis Enrique perhaps made a conscious decision that his Barcelona team would be at its most lethal and effective if the ball was delivered quickly to the team’s three world class attacking players Neymar, Suarez and especially Messi. If there were any fears that the arrival of two world class performers would have a negative effect on Messi, they have been unfounded. The new version of Barcelona is creating even more chances, with Messi no less effective than in previous seasons at reaching chance situations and attempting to create chances. This change of style has been fully justified and with devastating effect as his three attackers have together scored close to 90 league goals and provided another 47 assists during all league games played throughout the calendar year of 2015. Will Barcelona’s outstanding 2015 have the same effect in influencing how other teams try to play football, just as other pretenders attempted to emulate tiki-taka? Will their opponents find more effective ways to counteract their devastating attacking style? Whatever happens, SportsMatrix will continue to closely follow every action performed by teams and players throughout the world and will continue to provide the most accurate and in-depth coverage possible.